Jen Vincent at Teach Mentor Texts and Kellee Moye and Ricki Ginsburg at Unleashing Readers cohostIt's Monday! What are You Reading weekly on their blogs. To see what others are reading and recommending each Monday, or to participate, be sure to head over to these blogs. 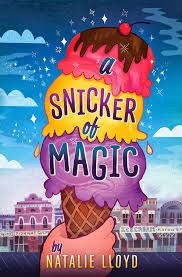 Last week, I read A Snicker of Magic by Natalie Lloyd and loved it! It just came out February 25th and is still only available in hardcover at most places. However, it is available in paperback online at Scholastic. This is a magical story about a 12 year old girl named Felicity who loves to collect words and in fact, sees words everywhere! Her mother does not like to stay in one place for too long and gets restless so they move a lot so they don't really have a place they can call home. Ever since the father walked out on the family, the mother has been very unhappy and not herself. Felicity is excited to hear they are going to the town of Midnight Gulch to stay with her aunt for awhile because she has heard that it used to be a magical place. While they stay there, Felicity becomes friends with Jonah and begins to learn about the magic that may still be in the town. She feels at home for the first time and is determined to bring back the magic into the town by breaking a spell and bring back happiness into her mother's life. This is a magical story full of surprises, friendships, secrets, and of course, magic! I feel like I may be letting some of my primary friends down this week, because my reading life was consumed by higher level chapter books. I promise to pay attention to picture books next week! I read three chapter books, but I am only going to write about one in this post, because it was so far and away the most compelling book I have read since Counting By 7's. I have Tara Smith to thank for the amazing recommendation of Laurie Halse Anderson's The Impossible Knife of Memory and I spent more time than I really had reading this book over the weekend. I loved Hayley, the main character who narrates with honesty, reflection, and humor and I already miss the other endearing characters who became her friends, even despite her efforts to sometimes prevent that from happening. I have three high-schoolers in my house and I can't wait for them to read it, although I won't be putting it into the hands of my sixth-grader for a while--there are many references to drugs, alcohol, and violence that I think are best left to the high-schoolers. That being said, the messages about friendship, family complications, financial hardships, and the struggles of our veterans are woven beautifully into this incredibly engaging story. Why I Love Charts...And I Do! I have now been in my role as the district's Writing and Social Studies Coordinator for a year and a half and I have learned so much in this position. One of the most important lessons for me has been about the importance of charts in classrooms at all levels. Yesterday, Melanie Swider wrote an amazing post about how her students use the charts in her classroom, demonstrating the importance and power of the charts. While I knew that charts were important from working so closely with Melanie for two years, I had not given as much thought about why they are so important. I started to think about why when Emily Smith, a TC staff developer worked with some of our teachers and rattled off the words independence and repertoire in the same sentence. I loved those words and have held on to them, as my goal for all writers in our district is to have pathways that lead to independence and repertoire. A chart is an important place to pause on that pathway. They are co-created with students, meaning that students in the room have been a part of or have directly watched them being developed. Therefore, the charts are not laminated or pulled from a cabinet of saved resources from past years of teaching. They represent the tracks of the teaching and learning that has happened within the room in front of the current students. This chart is one that I would envision being created over the course of several days, or being created as students are about to begin drafting literary essays, but may be at different stages in their growing of ideas. The charts retire after a unit and are therefore representative of the unit and lessons that are going on at that time in the classroom. Given that these assumptions are true, then I love charts because students can use them in order to be independent and develop repertoire. I loved when I was working in Melanie's classroom and students would look at the wall during a workshop. "What are you doing?" I'd ask. 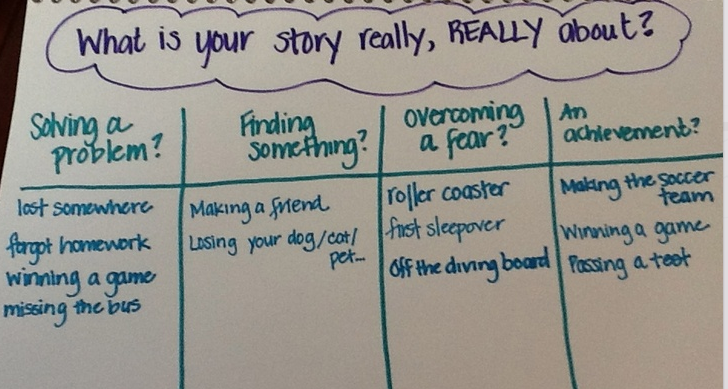 "I'm checking on that chart to see if there is a way that I could start my story," a student might say. Or, "I'm stuck and I know that there is a chart that will help me get un-stuck," another student might say. If we think about the gradual release model, this is exactly what we want to have happen. First, students receive explicit instruction. Then, they have the opportunities to practice the skills and use as much scaffolding as they need, provided by the charts on the wall. Eventually, they get to the point where they own the skills and strategies and they don't need the visual reminders in order to demonstrate their knowledge. Selfishly, as a coach, I love charts because I can tell exactly where a class is in a unit when I walk into a classroom if teachers are creating charts with fidelity. This helps me to coach both the teachers and the students-- I can see if students are practicing a skill that has been taught, which shows me that there has been effective instruction, and I can point to the chart and say to students, "It looks like you have had lessons on this--why don't you try..."
While there is more to love about charts than what I have written, I am sure, I also love charts because they focus the work for teachers. I would never say that a chart should be perfect; in fact, I would say exactly the opposite--a chart should NOT be perfect. Mel's charts tend to look perfect, even when she is making them with students. I am including here a chart that I made with a teacher spontaneously that is way less than perfect, but the students all find it helpful as they have been working on varying their introductions. In the case of this chart, I was writing students' responses on post-its as the classroom teacher was asking them about what introductions should include and they LOVED having their contributions publicly acknowledged on the chart--each post-it has a student's name on it. When you look at many of Mel's charts, as well as this one, you will notice that students' names are all over them and I think that this creates such a strong sense of ownership and pride that students are more apt to use the charts. 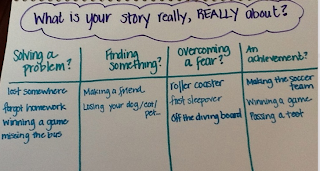 So, if you haven't checked out Mel's post about how much her students use her classroom charts, be sure to, and if you have any additional ideas and thoughts about charts, please share. Chartchums.wordpress.com is also a wonderful resource for learning about the importance of charts, especially for the younger grades. Students DO use the Charts in Our Classroom! For anyone who knows me, you know I LOVE creating charts with the students for every subject, write their name next to their contribution, and hang them up in our classroom so they can reference them throughout our unit. When some colleagues enter my classroom, they question why I hang the charts up and say, "You really think they use them?" I always defend my purpose and confidently respond with a YES! Yes, my students use them because they help create them and I write their name next to their contribution too! Even with my confident response, the look on their face tells me they still don't believe me and don't think the students use the charts at all. Well…last week, my students were planning for their literary essay for the end of unit assessment and as they were working, one student raised her hand and asked, "Where's the chart that we made that has all of our abbreviations we created for the important parts in a text?" Notice the key words in her question are, "We and Our". They feel ownership for these charts! Immediately the students started chiming in and asked, "Yea where is that chart? I keep looking for it and it isn't hanging up where it should be." Another student asked, "And where is that chart that has the possible thesis statements that we wrote together?" Gearing up for our March Madness Book Edition! 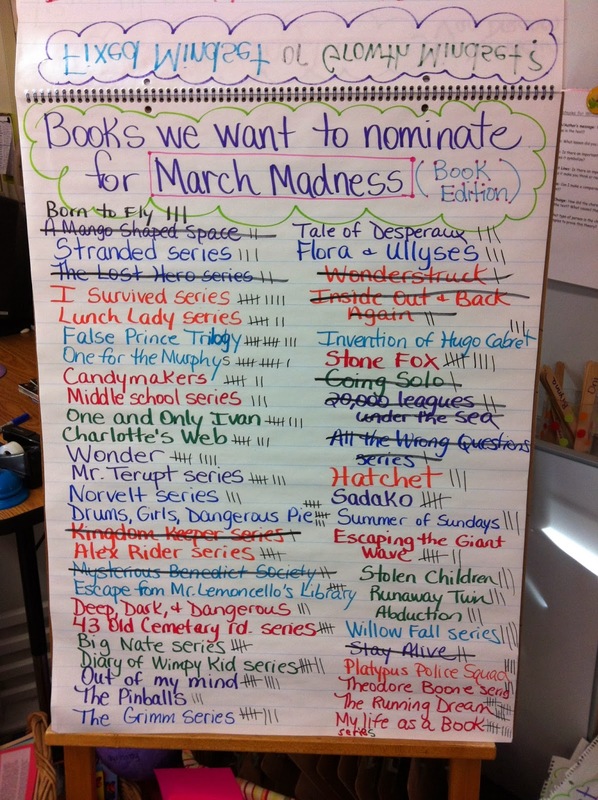 Last year, in the month of March, my class participated in March Madness Book Edition - click here to read my posts about the process of creating the brackets and voting. This year, I decided to start the process earlier so my students could have time to read the books they haven't read yet so they are able to vote for more books in March as we narrow it down from 32 books to 1! To begin, my class brainstormed a list of their favorite books. Then we began voting on the books from that large list to narrow it down to our top 32 books. I began using tally marks like I did last year at this point in the process, but then decided to try creating a form on Google Drive for the survey. I typed in the list of books and shared the form with the students so they could vote on their favorite books they wanted to nominate. Once all students completed the survey, I printed out the results and a group of students highlighted the 32 titles that had the most votes. Then a group of students paired up the book matches based on their votes so they were fair matches, but not too close that it would knock out a #1 book in the first round. Once the students made the matches, I had another group of students create the large chart with the brackets and we wrote in the titles of the books. I used post-its to mark the different levels: 32 books nominated; Sweet Sixteen; Elite Eight; Final Four; Championship. The students have been using this chart to choose books to read and create TBR stacks in preparation for our voting that will begin the first week of March! Stay tuned to hear the results throughout our March Madness Book Edition! To read my post that I wrote last year about our literary essay unit, click here. Each time we begin a new type of writing in writing workshop, we immerse ourselves in a whole class inquiry to read mentor writing pieces. As we read an example together, we discuss what characteristics we notice in this type of writing as well as similarities and differences to the writing we did in our previous unit. 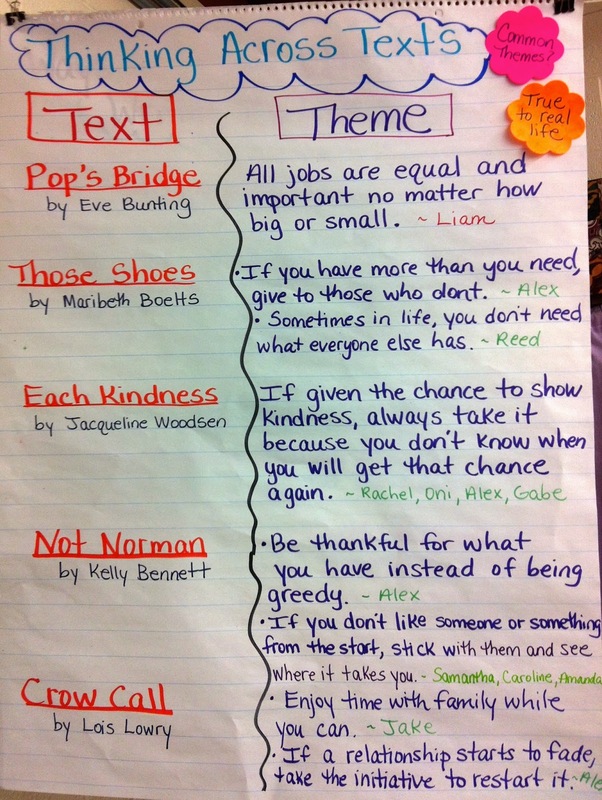 Below are two charts we created in our first 2 days of our literary essay unit. The first chart lists the characteristics we noticed while we read a literary essay mentor. 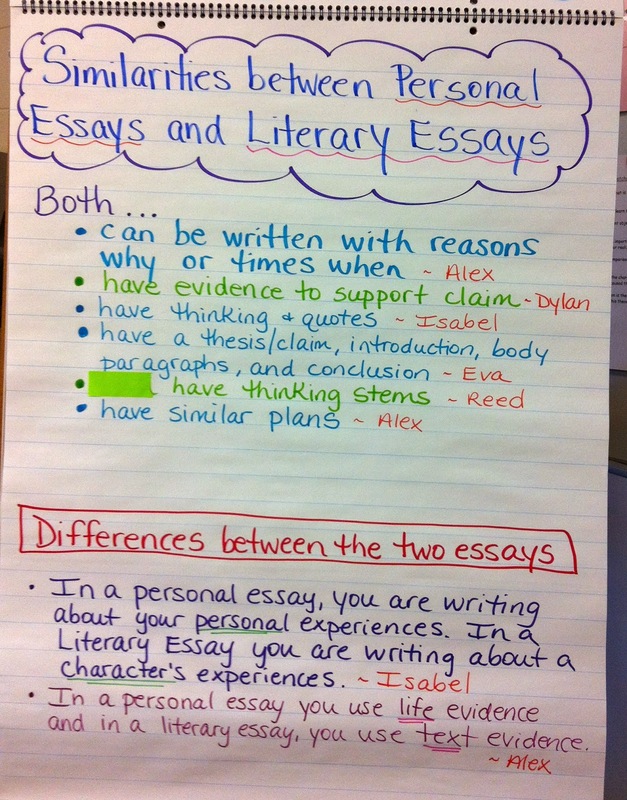 The 2nd chart, lists the similarities and differences students noticed between personal essays that we wrote in our last unit and literary essays. This lesson helped students understand and see how writers transfer skills and strategies and carry them forward to new types of writing and units. 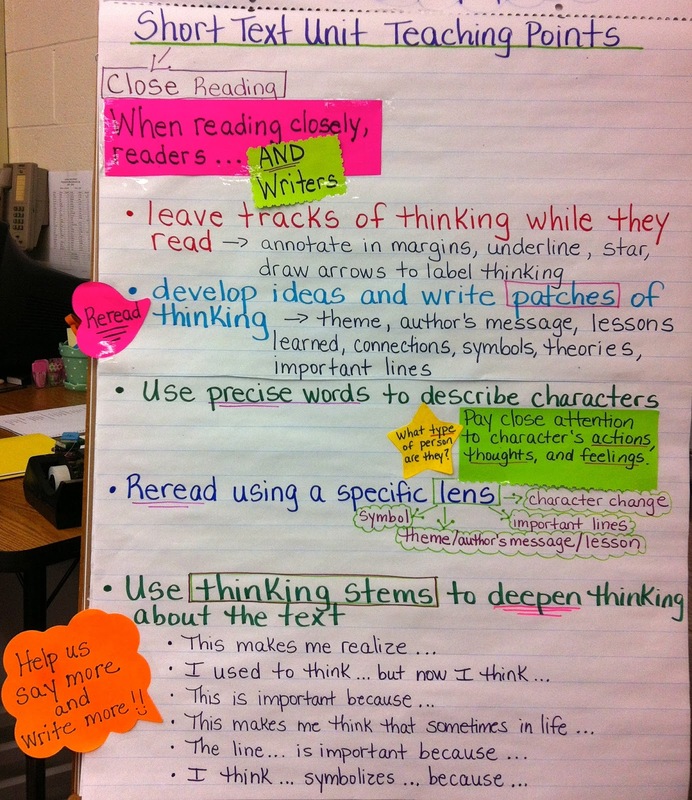 I think this type of work is so important for not just writers, but learners in all subject areas. Students need to learn and understand how to transfer skills and apply them in the future, not only in one unit or subject, but across units and across subjects. This type of work also makes increases students' confidence in themselves as learners because they notice how many skills and strategies they have learned so far! 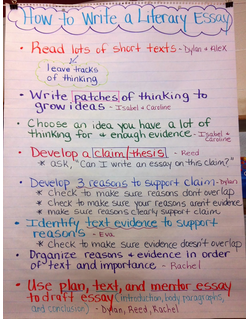 Throughout the unit, we have created a class chart that lists the steps to writing a literary essay. This chart was created with the students, as all of my charts are, and you will see the students name next to their contribution. 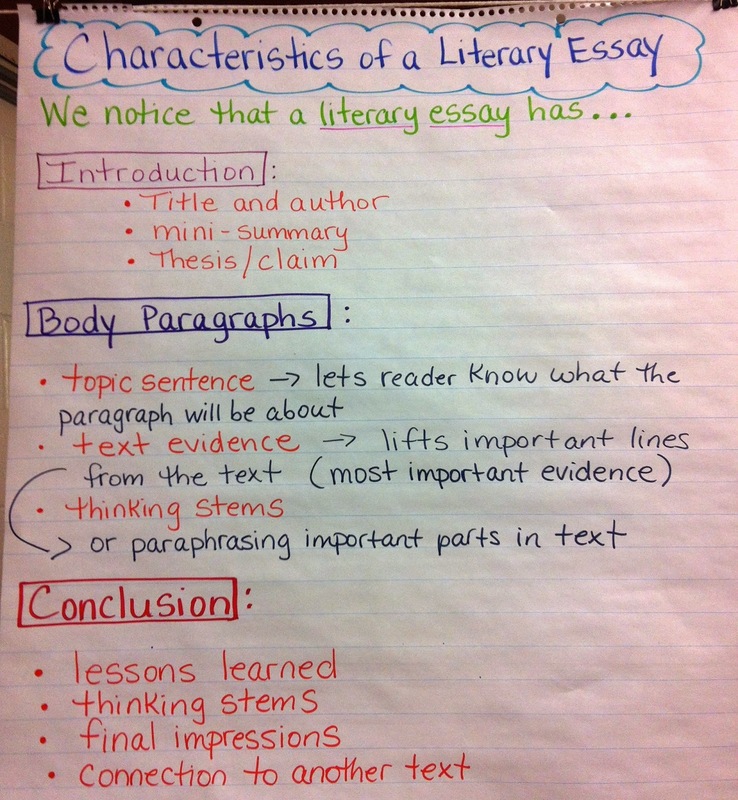 This chart has been a helpful resource to the students as they write their literary essays throughout this unit. Each year, I work with students on developing more sophisticated claims/thesis statements. 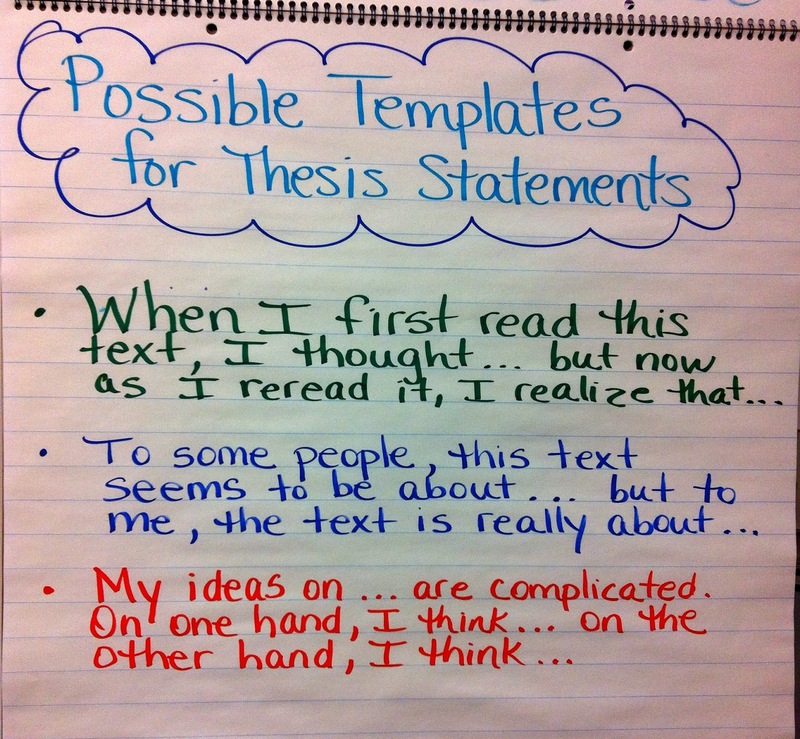 This year, I read the new Literary Essay book in the TCRWP writing units and saw some new possible templates to introduce to students that they can use when developing thesis statements. These have helped my students write more sophisticated claims this year and have given them additional ideas on how to frame their claims. Stay tuned to hear more about our literary essays next week! 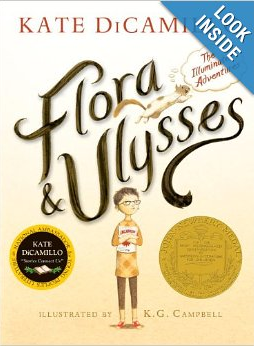 I'm late to the Kate DiCamillo party, but I finally got to Flora and Ulysses. I have to say a huge thank you to Kate DiCamillo for being such a master at finding the sparks of stories in every day objects and events. Older students may steer away from it because of all of the illustrations, but younger students will be challenged by some of the complexities of the plot. In any case, what an incredible imagination Kate DiCamillo has and what an incredible job she has done at blending serious childhood issues with humor, fantasy, and quirkiness! Although this would be a tricky read aloud since so much happens within the pictures, it is a wonderful book for launching discussions about empathy. It's also an incredible mentor text for teaching young writers to know their characters well--how about Flora's father who drives with his hands always at 10 and 2 on the steering wheel? My daughter picked out Remarkable by Lizzie Foley at the bookstore and I was in need of a book, so I took it from her nightstand. This book is full of wonderful characters, complex plot twists, subtle humor, and less subtle messages about celebrating normal. 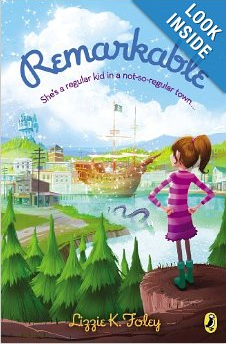 Remarkable is a town where everyone is gifted and everything is the best, except for the heroine, Plain Jane. Except for the length, this would be a great read-aloud, full of vocabulary, references, and content information, all woven together in a compelling, multi-layered plot. If you have students who enjoy mapping out character relationships, they will especially love this book! 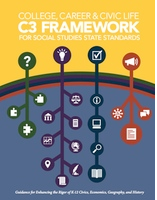 Professionally, I have been reading and rereading the College, Career, and Civic Life (C3) Framework for Social Studies.I am hoping that this document will launch social studies into a more prominent place in American education, as the connections between so many of the CCSS are so accessible through social studies. Through an inquiry arc, the C3 emphasizes formulating questions, learning content in order to answer them, evaluating and critiquing the sources, and then taking informed action--writing papers, having debates, making presentations...Every time I reread this document, I am more in awe of it and hopeful of the impact that it could have on what students learn in schools. As a coach of writing, I am in a lot of classrooms. I hear a lot of great statements and I see amazing teaching moves. One of my personal goals as a writing coach is to help teachers develop independence and repertoire for their students. When students become more independent, they become more confident, take more risks, produce more volume, and...write better. Student independence also frees up teachers to teach more! Last week, I saw an amazing lesson and have a new favorite line. I was in one of our district's fourth-grade classrooms and the teacher we giving a lesson to the students about all of the tools that they have as writers that help them to be independent. 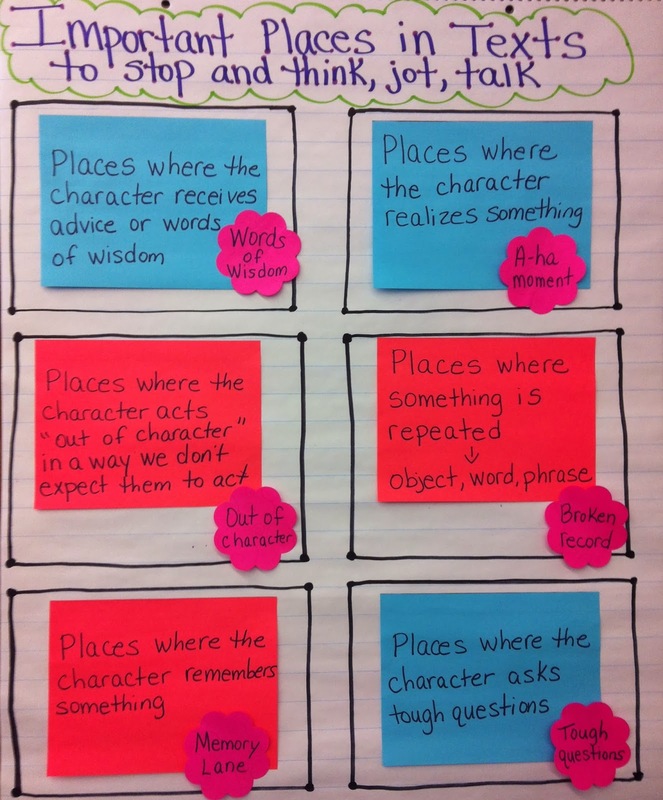 Although this lesson was part of her Information Writing Unit, the chart could be created in ANY writing unit, and the take-aways for students should transfer to ALL writing units. Together, they created a chart that I shared with and then taught with one one of her colleagues. The orange is tough to read, but the tools that they have are: checklists (from the Teachers College new Units of Study), charts (made together with the students in support of the unit), mentor texts, dictionaries and thesauruses, writers' notebooks, each other, and their imaginations. When I watched the lesson, I heard one of my favorite lines from a teacher, EVER, and I don't think that she was even aware of the importance of the line when she said it. "Everything in this classroom is made by you or for you." Because of the truth of this statement, the class was able to generate the list of tools as an inquiry lesson. Her colleague's classroom, also, is full of charts and student work, so when we taught the lesson, the students were able to think of ideas for writing tools. We spontaneously made this a Family Feud game--I covered the answers with slips of posterboard and we revealed them as each team took turns guessing. We had not originally had imagination on our list (duh! ), and we gave a bonus point for such an amazing response! Did we miss anything? Independence is so important! 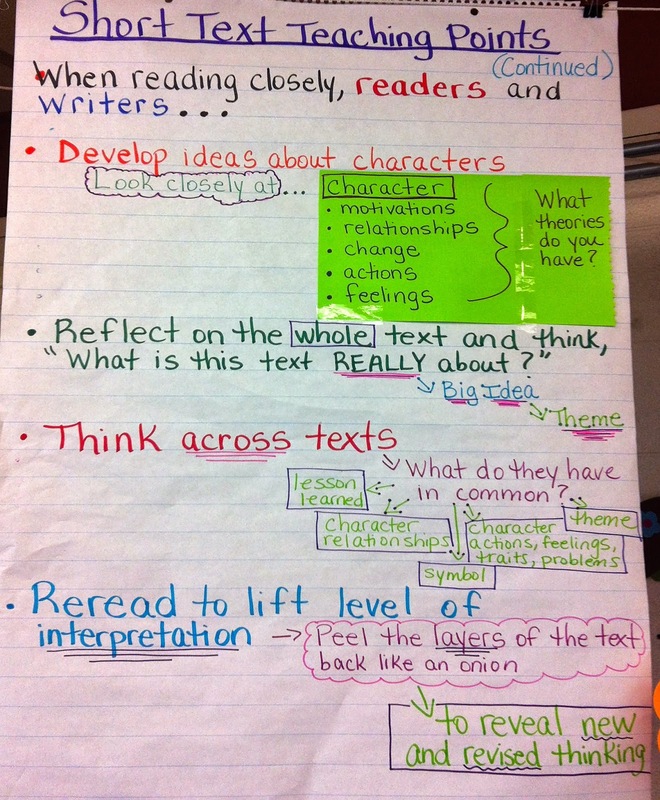 We are currently in the middle of our Short Text unit in reading workshop and Literary Essay unit in writing workshop. These two units are integrated and students are learning how to read texts closely to lift the level of their interpretation, deepen their comprehension, and strengthen their conversation and writing about reading skills. 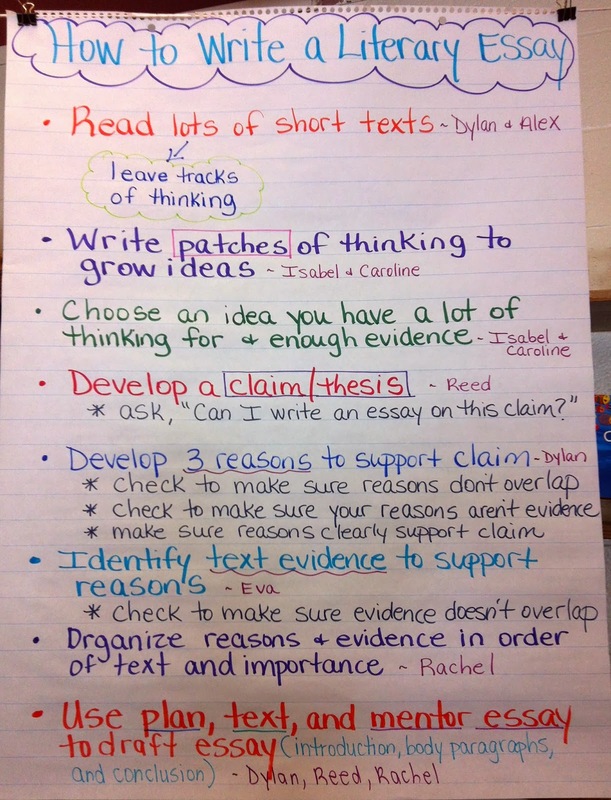 Students are learning how to leave tracks of thinking on short texts, write patches of thinking by stretching out their interpretation with thinking stems, and write literary essays about a claim they have for a short text. Stay tuned for a post about our literary essays tomorrow! Before beginning each unit, I always have a conversation with students about the unit's purpose and how it is going to go for us as readers and writers. 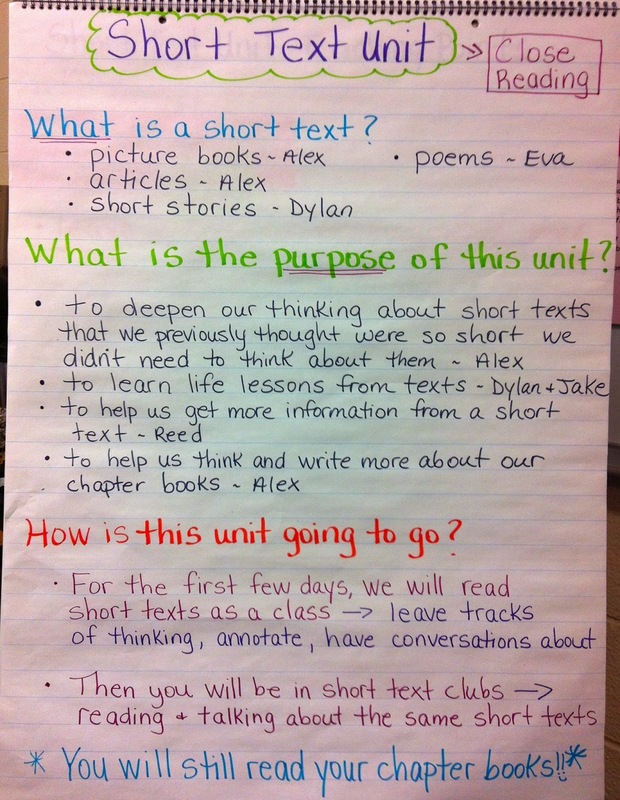 Below is the chart we created during our first mini-lesson for the short text unit when we discussed its purpose. Prior to the conversation, I wrote the questions on the chart and left room for student's comments and thinking. This chart was completely co-created with students as you will notice their first names beside their contribution. Also notice the important statement at the bottom of the chart - "You will still read your chapter books! :)" It is so important to continue to have students read their chapter books independently no matter which unit we are teaching in reading workshop. Students need to continue to strengthen their stamina, ability to hold onto their thinking through a longer book, have choice, and transfer the skills we are learning into their independent reading of chapter books. Below are two of our charts that were created to keep track of our teaching points for each mini-lesson. We create teaching point charts for each unit to keep track of all of our teaching points so we can refer to them during mini-lessons to build onto our learning and students can use them as resources while working independently. New teaching points are added to our chart at the beginning of each mini-lesson. These charts are great visuals for the students to see all the skills and strategies we have learned and are practicing as readers and writers. Below are two charts that were created during mini-lessons on how events impact characters and teach them lessons and how to identify the theme in texts by thinking of the whole text. These charts were created with the students as you will notice their names beside their contributions during the lesson. 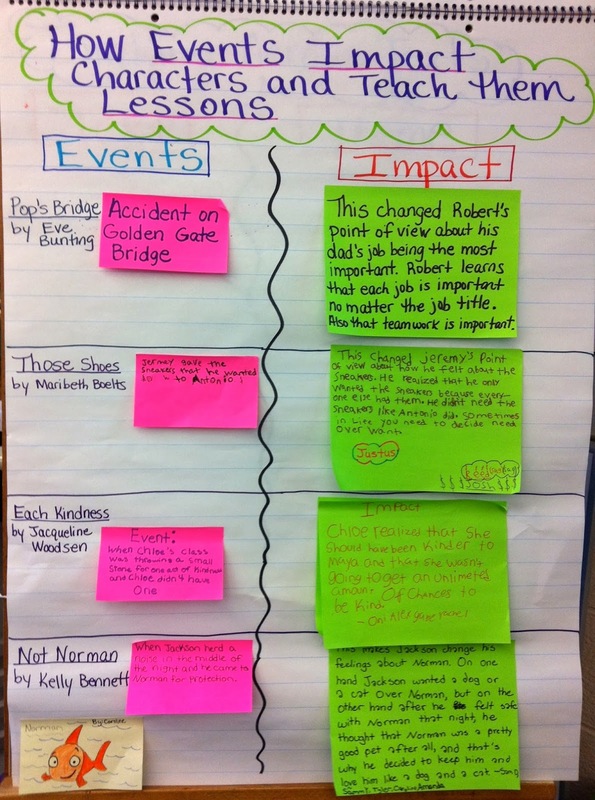 For the chart to the left on impact and lessons, I gave each short text club a choice of which text they wanted to use for this important work and gave them two post-its (one medium and one large). I gave them about 5 minutes to work as a group to identify and agree on an important event that impacted the main character and write down how it impacted the characters and taught them an important life lesson. Once the groups were done, they added their post-its to our chart in their sections depending on which text they chose. One professional book that I reference in this unit is Notice and Note by Kylene Beers and Robert E. Probst. To read my post about Notice and Note, click here. If you haven't read this book, definitely add it to your stack to read soon! In this book, they share six important "signposts" that are significant moments in texts where readers should pause to read more closely and think deeply about. Kylene and Robert have specific names for each signpost and give a description of these significant places in texts. Rather than give students the names of the signposts, I wrote the descriptors on large post-its and placed them on a chart at the beginning of the lesson. I asked students to read the descriptions, think about them and how they may be connected, and share what they noticed with their partner. After talking with their partners, they realized all of the moments can be connected to one another and shared how one can lead to another. Then I modeled identifying these moments in our first chapter book read aloud, Drums, Girls, and Dangerous Pie by Jordan Sonnenblick. Students then tried this work out with their partner by identifying the six moments in our other chapter book read alouds and were excited to find out that all of the books had these 6 moments! To end the lesson, students created names for each of the six places and I wrote the name on a separate post-it near the description. By having the students create their own names for these signposts, students internalized them and began using them right away because they felt a sense of ownership in developing these important places to pause in texts to think, jot, and talk! I was excited to read Patricia Reilly Giff's new book, Winter Sky, that came out in January because I love all of her books! 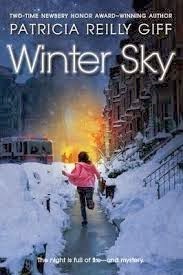 This book is about a young girl, Siria, whose pop is a firefighter. Her mother passed away when she was very young so she is extra protective of her father and doesn't want to lose him too so she begins chasing fires to make sure he is safe. As she begins chasing fires, she becomes suspicious that there is someone in their neighborhood who is setting fires on purpose and may be an arsonist. She begins to investigate it and link the clues together bit by bit and they lead to someone she would least expect. But is she correct or does it turn out to be someone else? This book is a shorter chapter book at 152 pages and engaging so I see it as a perfect fit for reluctant readers as well as any other reader who may enjoy this story! Enjoy! I love all of Lois Lowry's books so I do not know how I missed out on reading Gossamer until now! One of my students recommended it to me last week and insisted that I read it because she loved it and knew I would too - thank you Eva!! I read this book yesterday and could not put it down. It is a story that integrates reality and fantasy together to form a beautifully written story. It is about a group of tiny dream-givers who help give dreams to humans by visiting their house at night, touching important objects that may have great memories attached to them, and bestowing dreams upon them. One dream giver, Littlest One, is learning how to give dreams and is fascinated by the whole process and is full of questions for his teachers. At the house they are working at, there is an older woman who takes in a boy who is a foster child. His father was verbally and physically abusive to his mother and to him so he was removed from their home to live with this woman until the mother could get her life back together and create a safe home for the boy. I love how Lois Lowry intertwined the story of the mother, the boy, and the older woman with the tiny creatures who are giving dreams and trying to fight off the nightmares that the Sinisteeds try to give the humans that they are looking after. I really enjoyed this story and highly recommend it if you haven't read it yet. Enjoy! Since the beginning of the school year, I have been teaching students about the concept of mindset and the difference between having a growth mindset and fixed mindset. Click here to read the post I wrote about introducing this important work to students in September. Throughout the school year, we have been identifying characters, through read aloud and independent reading, who have a growth or fixed mindset and discussing why. We have also role-played during morning meeting and/or closing circle what having a fixed mindset and growth mindset look like so students have a visual for the differences between the two. Students use the language of mindset often in our classroom discussions and some students have even written literary essays about characters who have a growth mindset. So they are transferring the concept of mindset into their daily language, their reading and writing, and while they are working on math challenges as well. So this past week, I decided to have them reflect on their mindset and how it might have changed from the beginning of the school year. Do you consider yourself to be a person with a fixed mindset or a growth mindset? Why? Has your mindset changed since the beginning of the school year? Why? "I think I have a growth mindset because I never give up and I also always try my best. If I make a mistake, I will try to fix it and understand why I made that mistake. This is why I think I have a growth mindset." "I think I had a growth mindset at the beginning of the year and I still have one now, but I think now I look at things differently for the better. I don't know how to explain, but I feel more positive like I am more self-confident. I feel accomplished and proud of myself even though I have a ton more goals to reach." "I think I have a growth mindset because I like challenges and I like taking risks. This tells me that I like to never give up. I set a goal to always try my best and be responsible and kind. I always try to put 100% effort into my work at school and at my house." "I started having a growth mindset in the beginning of the school year because I started becoming a better reader. I'm putting 100% effort into my essays now. I'm being more respectful now then the beginning of the school year. Now I have more of a positive attitude now then the beginning of the year." "I consider myself to have a growth mindset. I think this because I don't give up on things or people. I don't give up on things because my family doesn't give up and I want to carry that on. I don't give up on people because people will bring you down, but I was taught to always have the strength to pick yourself up and tell myself, I don't deserve to be treated that way!" Reading through all of the students' reflections, gave me clearer insights into how they perceive themselves as learners and how I can also help them continue to work toward having a growth mindset. It also raised an important question in my mind: Are mindset and kindness connected? As you can see from a few examples shared above, some students connected the concept of having a growth mindset to being kind and respectful. This year, one of our school-wide objectives is to teach students how to be kind and use respectful language with one another. I have not talked about how being kind is related to mindset, but obviously students are seeing the connection on their own and are bridging the two together in their minds. I have thought long and hard about this over the weekend and I do see how they are connected and want to have this conversation with my whole class to create a chart on how they see mindset and kindness connected. From reading their reflections, it seems that they believe if you have a growth mindset and know that everyone CAN do something with practice, then they won't be tempted to tease someone for not being able to do something well YET and will be kind. Also if someone has a growth mindset and likes to take risks as a learner, they are more apt to cheer their classmates on and try to boost their confidence in themselves which is being kind. They are also more likely to stand up for classmates who may be receiving negative comments from classmates. This is just what I have brainstormed myself after reading how some students connected mindset to kindness in their reflections. I am eager to have this conversation with my whole class on Monday so stay tuned to hear more!